I’ve always loved pancakes, especially the apple pancakes that my mom used to make. When I was a kid I adored going to small pancake houses that made syrups from strawberries and other fruits. These days such syrups taste artificial, probably because local pancake houses are hard to find and the corporate chain pancake houses that have replaced them don't make syrup with real fruit. Spurred on by my recent success with strawberry dressing and apple syrup for pancakes, I decided to try making strawberry pancake syrup. 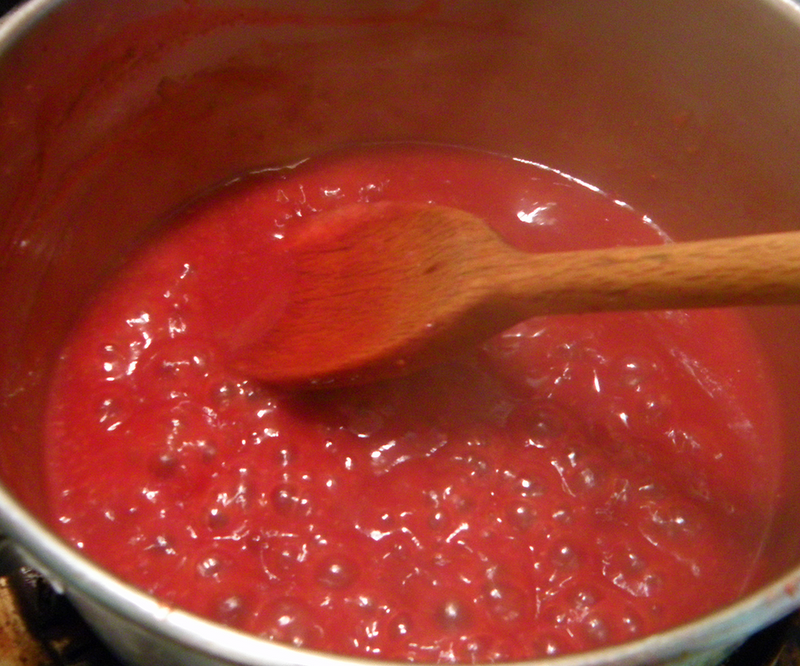 I chose evaporated cane juice (raw sugar) as the sweetener, because I knew sugar would help thicken the syrup. You could choose to use plain sugar instead, or experiment with honey or agave in somewhat smaller quantity. Or try maple syrup for a more exotic blend. If your berries aren’t very sweet, you might need to add a little extra sweetener. Try the syrup on plain pancakes garnished with sliced strawberries. 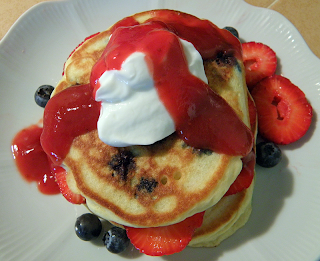 Or make a fun Americana breakfast with strawberry syrup over my blueberry pancakes, garnished with sliced strawberries, whole blueberries, and a dollop of yogurt or whipped cream. 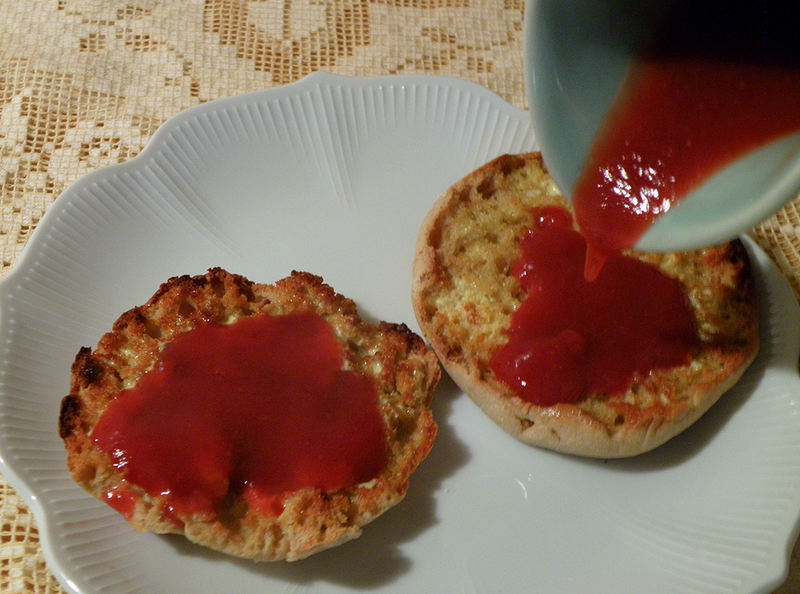 Or try it on English muffins or any other place you’d use maple syrup or strawberry jam. Do post a comment if you find a delicious way to use this stuff! Add crushed strawberries and water to saucepan. Bring to boil. 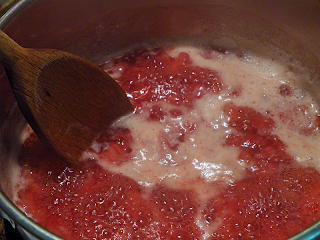 Adjust heat so that berries are releasing air (making foam), but not foaming up in the pan. Boil for 10 – 12 minutes, stirring occasionally. Cool slightly and pour liquid into immersion blender cup. Puree with immersion blender. Pour liquid back into saucepan. Add evaporated cane juice or other sweetener. Bring to boil and boil hard, stirring constantly, until thickened to consistency you like. This will take around 5 minutes if you’re using evaporated cane juice, perhaps longer with liquid sweetener. Serve syrup warm or at room temperature.